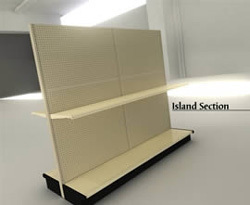 New & Used Store Shelving, Display Shelves & Retail Store Fixtures. Store shelving is the most inexpensive way to create great store layouts in not so great times. If you make a moderate investment in premium, painted, store shelving, people will instantly tell the difference between your store and the ones owned by your competitors. New store shelves will help you merchandise your very best and most significant products in places of prominence where they have the best opportunity of being seen by holiday shoppers. No doubt you have already set aside the hottest items on special, so maximizing your showcasing power can increase your chances of good sales even more. It’s all about space planning, arrangement, and management. Because less can be done for more when you plan first, you will not have to pay an arm and a leg store shelves—just enough to make a difference between marginal sales and profitable sales in this very problematic economy we currently face. 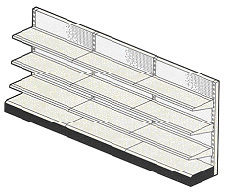 You can order two different kinds of used or new store shelving from Easy Rack. Double sided, pre-owned store shelves are also known as aisle shelves. They are the shelves that run vertically through the center of your floor area and create passageways for foot traffic and shopping. Because these displays feature a solid-piece construction, they are very easy to move and rearrange for after Christmas sales. Some people are using single sided shelving stacked back to back, but this is inefficient and does not offer you the freedom to rearrange as easily. Single-sided shelves are better used as wall shelving. Almost every store has unused wall space, and most gas stations and convenience stores have at least one empty corner. Because wall shelving units are only 48” wide, they can fit in most of these cubby-holes spots and convert wasted space into valuable display space. One-sided shelving units also make excellent end caps. If you are not using end caps for your hliday sales, please let us help you set some up. These are vital components to target marketing certain products to customers right when they walk in the door, and they can make the difference between marginal profits and good profits. The right kind of store shelving can also aide you in loss prevention. You already know how the way that you arrange your shelves plays a major role in keeping an eye on your merchandise. Fewer things grow legs and walk away when a camera or human eye is watching them. You can’t do this, though, if the shelf is too tall. Generally speaking, the tallest we recommend that any store owner goes with vertical shelf height is 84”. Most smaller stores, especially convenience stores, really should stick with 72” or less. The shelves themselves are so sturdy that even with less vertical space, more can be placed on the display. Each shelf can handle 350 pounds, so strength makes up for the lack of height. Adjustability is the key the attraction factor. If your present store shelving looks dark at the bottom, it is because the shelves extend to identical depths. This, of course, blocks the light from the lower shelves. Adjusting your shelving will fix this. Simply make each shelf slightly less in depth than the one above it. This will create a “cascade” lighting effect that not only reaches the bottom of the display, but lights the entire space within so customers can see all the products. Easy Rack carries a wide variety of used pallet racks, commercial shelving, material handling equipment, and modular prefab buildings installed nationwide. If you can not find what you are looking for call us toll free at 1-888-776-3720 and we will find it for you. Our home office is located in Houston, Texas with warehouses located throughout the United States that enable us to service all 50 states including New York NY, Los Angeles CA, Miami, FL. Chicago, IL. Denver CO., New Orleans, La., Cleveland, Ohio, Kansas City, Mo., Mesa, Arizona, Virginia Beach, Va., Omaha, Nebraska, Oakland, California, Miami, Florida, Tulsa, Oklahoma, Minneapolis, Minnesota, Colorado Springs, Colorado, Arlington, Texas, Beaumont, Tx., Corpus Christi, Texas, El Paso, TX, Brownsville, Texas.